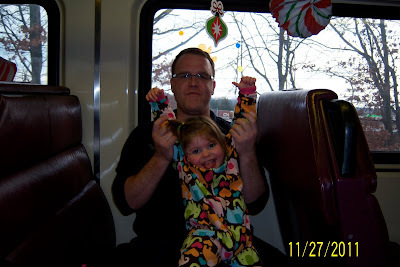 Today we went on a Polar Express train ride to the North Pole! Which, in case you did not know, has relocated to the Readville train station : ) The event benefited Saint Catherine of Siena School and was organized by a mom we met recently at a couple Rett Syndrome functions, Paula Curly - an awesome mom who does so much for Rett Sydrome and is just an inspiration. One plus of an event organized by a Rett mommy is that they had a special needs friendly car. We left Norwood Central at 12:30 and went on a 50 minute train ride where the conductor read the Polar Express book to all the kids and we got to see Santa's elves. Meredith was given a bell, candy cane and cookie and she tried hot chocolate for the first time. We saw frosty the snowman and then Santa himself made an appearance. It was a lot of fun and we got to see a few of the new friends we have made in the Rett community. A great way to end our long Thanksgiving weekend and kickoff the holiday season! Last year Meredith was in the hospital over Halloween so she never got to be Wonder Woman as planned. 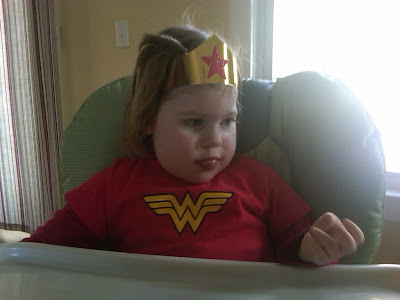 So it's been a long time a coming, but at last Wonder Woman made her appearance this Halloween. More great stuff happening with Rett research.